But then they say, "But if there was no income in that time, you do not have to file a return." OK, IRS. Thank you for your consistency. And she opens the door. And hands him the check. Someone had found it blowing around on the street. And had taken it back to her house. Primo was so excited when he came back from doing doors yesterday. "This woman was so excited that I'm running that she wrote me a check!" he said. "A hundred dollars!" That actually is very cool. For someone to give that much money and to give it without even being asked - that is rare in our experience. I don't think there were many contributions that big from people Primo did not know in his first campaign. This is actually a big, big deal. This morning, he couldn't find the check. And couldn't find the check. And couldn't find the check. He was panicking. As he does. Primo is a panicker. I tried to detach myself from his palpable panic because it does me no good to get sucked into the panic, but I was working from home, sitting at the kitchen table, well within range of his panic. He couldn't find it. He went out and retraced his steps and still could not find it. "I clipped it onto my clipboard but it must have fallen out of the contribution envelope," he said, shoulders slumped. "Now it's probably blowing around loose out there. What if someone gets her banking information? What if someone tries to cash it? I have to tell her." He sighed. "I have to tell her that I will pay the 'stop payment' fee. I don't want to." My evil marketing mind jumped on it. "Yes. You do. First of all, because it is the right thing to do. But can you imagine the good PR you would get out of this? All her friends she is going to tell about you? 'This guy came back and told me that he had lost the check but then gave me $40 to cover the stop payment fee! This is the kind of integrity I want in an elected official!'" 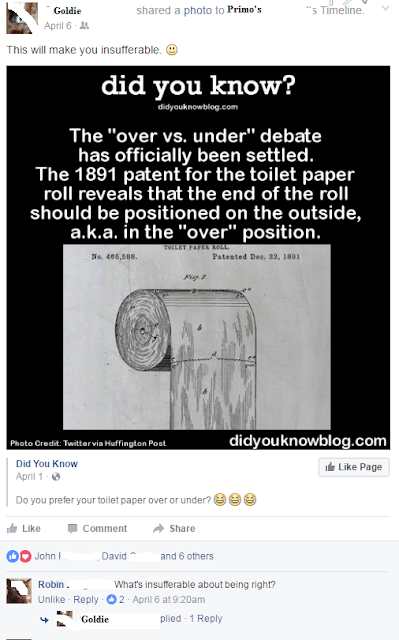 I was at a work dinner last night with a bunch of engineers and the topic of the proper direction for the toilet paper came up, as it does. There was some argument, as there is. I told the story of Primo being at his friends Tom and Kathy's house and thinking that he should change their toilet paper for them because they were Doing It Wrong and my co-workers shook their heads, agreeing universally that it is Not Done to change the toilet paper in someone else's home. Just Not Done. Which is when I had the brilliant idea of having Tom change the toilet paper in our house when he comes to visit next month. Primo is not good at gently extricating himself from conversation. He is a polite person and he doesn't want to be rude, which is fine, but one must learn to get out of unwanted conversations. Anyhow, the guy who called talked for a while. He is the guy who in the first campaign wanted, a week before the election, to completely re-design Primo's campaign strategy. All I wanted him to do was to deliver yard signs. Which, eventually, he did, but only after I had a few, "Yes, we would love your input but right now, the most important thing that we can do for the campaign is to make sure there are yard signs up in the yards of all the people who said they would take them. It would be an enormous help for Primo if you could deliver a few." This time, the Nice Sincere Neighbor wanted to know if Primo knew about this guy who had switched from Party Stripe to Party Polka Dots. He lives in the next county over and NSN doesn't know his name, but he is sure that if Primo could meet this guy, this guy would be able to help Primo with his campaign strategy. Well. That was a useful phone call. SLAM! Keith and I WIN! Former Tenant had given Keith an address for someone who Keith thought was maybe FT's mother. appears not to know FT. Someone wrote "Wrong address?" on front of the envelope and returned the letter. We wrote a very cordial letter to include with the unopened returned letter explaining that he had mailed the original on May 20, as was clear from the postmark, but it had been returned to him today as the people at that address appeared not to know who FT is. FT has made poor Keith's life so stressful and it was all her fault. Apparently - and I have not seen it yet - undeliverable. She has sent nasty emails to Keith about her deposit yet she gave him an invalid address? And Primo and I cannot figure out who it is until after we have played the message three times. Just as he is sighing and saying, "It's Nice Sincere Neighbor," the phone rings. It is Nice Sincere Neighbor. Calling about I don't know what. But Primo answers my phone just to get it over with. They are still talking. It's been about six minutes and all I have heard on this side is answers to apparent questions about the national convention - an event over which Primo has absolutely no influence.